*This is a sample itinerary, subject to change at any time. Please email us with specific requests. Most mornings will start with an optional yoga class, workout, meditation, or something of that sort to start your day off right! Once completed, we will pack up everything for an early departure by 9am. Our first stop is the famous Tarcoles crocodile bridge for a visit and photo op, then a trip down the coast line arriving at our first camp at a gorgeous eco-hotel where we’ll teach the women how to set up their tents and prepare camp, then go for a swim in a beautiful river, and have a cacao ceremony to welcome everyone, followed by bonfire and cookout. This will be a day to stretch your “overlanding” muscles! 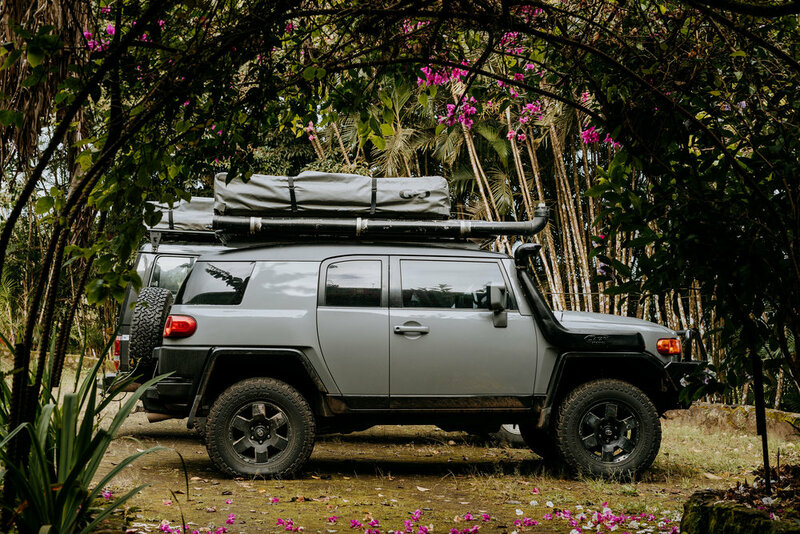 We will meet up with an amazing group of local female overlanders, who will take us out for a day of off-roading through the Costa Rican jungle and show us to an amazing hidden campsite for the night. We head to Manuel Antonio National Reserve. First we start with an amazing ATV tour through the jungle, followed by a hike through the canopy and a visit to Rainmaker Waterfall. Back to get checked in to our home base hotel for two nights. Free afternoon time to lay by the pool before dinner and an evening bonfire on the beach. Sleep in a bit in your comfy hotel, then we all go to a monkey rescue to visit with 6 species of monkeys, and of course, sloths! We’ll spend a few hours here doing a little volunteering and a lot of cuddling. Then in the evening we take a night time trek through Manuel Antonio to spot some of the nocturnal critters! Back in to the rigs as we head out to the beach town of Dominical. Once we arrive, we will set up our beach camp among the locals and other overlanders who camp at this popular spot. Today will be a free day so plan to roam the markets, hang out on the beach, or take a surf lesson with some of the talented local guides. We’ll all come back together in the evening for a dinner at the local brewery, Fuego! Today we leave the rigs in Dominical and jump on a shuttle for a day of snorkeling on the islands nearby Uvita, Followed by lunch overlooking the famous Whale’s Tail, a short beach hike and then back to Dominical for one more night of camping. We start heading back up North today. We’ll stop along the way for a tour of a local Blue Clay Farm and check out some of the handicrafts made with this amazing substance. Then on to our final camp of the trip on the beach. We’ll get picked up for an evening Catamaran tour where we will sail among dolphins while we sip cocktails and watch the sunset. Back to the beach for a bonfire and dinner. We’ll have a little sleep in today so everyone is well rested for the drive back to San Jose. We’ll arrive back in the city where we’ve arranged a walking tour of the beautiful neighborhood of Barrio Escalante. When you return to the hotel, we’ll show you a video of your amazing trip! In the evening, we’ll take you to some of our favorite hotspots in the city! Be ready for a night of good food, good drinks, and dancing! One last session of morning yoga before everyone heads off to the airport! What an adventure! !